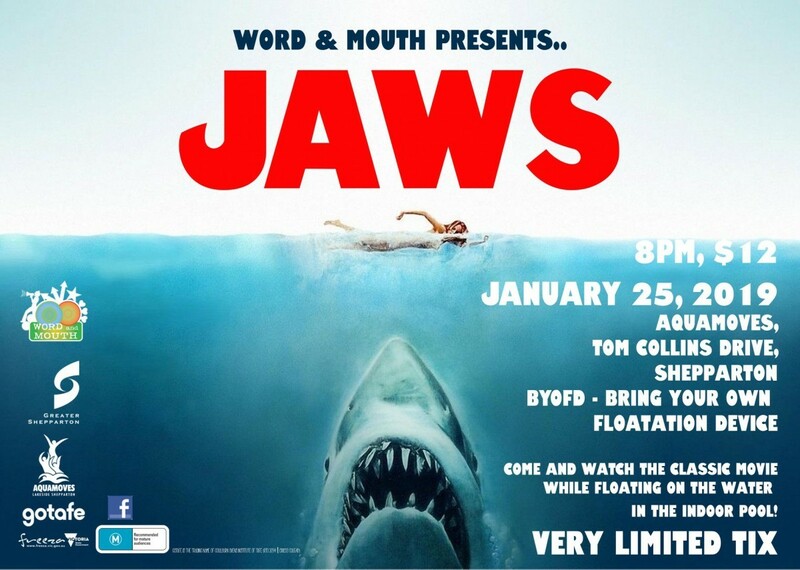 Word and Mouth presents: Dive-In Movie – Jaws! - Aquamoves – Indoor and outdoor pools, fitness facilities and programs in Shepparton, Victoria. Greater Shepparton City Council’s Word and Mouth open their events calendar this Friday 25 January with their “Dive-In Movie – Jaws!” held in partnership with Aquamoves at the indoor pool on Tom Collins Drive. This event is the first of its kind in Shepparton, not only the screening of the legendary scary shark movie to be shown, but viewers will be floating in the pool whilst they do so, giving it an immersive feeling of being in the water with the shark. Aimed at young people aged 15 and over due to the horror themes, it promises to be another big event held locally for young people. “We’ve had this pinned to our ideas board for a year or two, and we managed to align the ducks and get it off the ground this time. People will also need to bring their own inflatable device; that’s a must,” said Mr Gow. This event is one night only and bookings are required through Eventbrite prior to the night. Entry is $12 per person and no tickets sold at the door. Doors open at 8pm and entry is via the main Aquamoves entrance. Tickets are limited for safety purposes and more than half the tickets sold within the first couple of weeks. No BYO food, however food, including popcorn and drinks will be available from the venue. Search Facebook for more details. Every Word and Mouth event is fully supervised, and is drug, alcohol and smoke free.